Have you heard of Dry Ice Blast Cleaning? If you run electrical machinery that needs to be kept clean and sanitary, then it could be the perfect cleaning solution for you. Eco-Genics are a company in the south of Scotland who have won awards for their dry ice blast cleaning business. Their dynamic approach has been noticed and utilised by many well-known Blue Chip Companies because their service is safe, reliable and effective. Food manufacturing companies could largely benefit from this type of cleaning service due to its simple, mobile and effective methods. And, with there being only a few in the UK, it’s worth noting the name: Eco-Genics. Both large businesses and small ones will benefit from this service because Eco-Genics bring their Dry Ice Blast Cleaning equipment straight to your location. One of the major benefits of dry ice blasting is the ability to clean electrical or mechanical parts while they remain in place and still hot. This means that any machinery downtime is reduced, saving you time and money. The cleaning technique is also much faster than traditional methods and provides superior results. This leads to increased efficiency and extended life-span for your industrial equipment. Dry ice blasting is also non-toxic and ecologically friendly which creates a safe atmosphere for your workers, and helps you to meet environmental regulations. 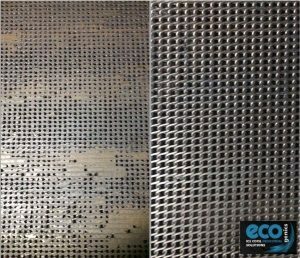 If Dry Ice Blast Cleaning is something you’re considering and you’d like to find out more, contact the Eco-Genics team on 01461 500206, or visit their website.